Jointly funded by the Lawn Tennis Association and the government via its New Initiative Fund, William Martin was appointed as project managers to the employer, the London Borough of Bromley to provide this tennis centre comprising six indoor courts and four outdoor courts. 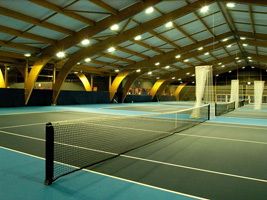 The indoor courts are covered in a ‘Glulam’ timber portal frame structure which also incorporates changing facilities, offices and extensive viewing areas. The timber structure was designed in the UK but the ‘Glulam’ components were manufactured in France. The portal frames are supported on steel auger piles which were screwed into the clay ground at raking angles to withstand the horizontal foundation loads. The piles were capped off in traditional reinforced concrete caps with a perimeter ringbeam to contain the macadam of the tennis course. The project was completed at a cost of £2 million.